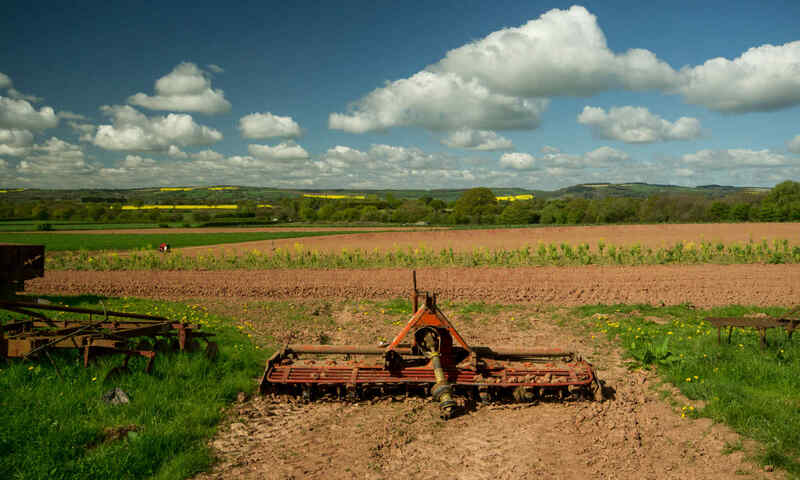 Drop any line on a map of the countryside around Ledbury and you are likely to cut through a number of different farms, each with their own way of working the land and with their own portfolio of produce. That’s just what Ledbury Food Group did last month – only we walked the line, met some of the farmers and enjoyed some of the produce! For the second year running, Ledbury Food Group contributed a walk to the Herefordshire Walking Festival. Our walk this year was titled “A Ledbury Farming Year Revisited” and was an extension of our first photography project from 2015. As well as revisiting the photographs, and meeting the two farmers who took part in the project, this time we added some extra encounters with farming in the Ledbury area. Some of you may remember that Monday 19th June was one of the hottest June days on record! So when seventeen walkers joined the DRM 476 bus service from Ledbury, we made a quick check that they were all well equipped with hats, sunscreen and plenty of water! 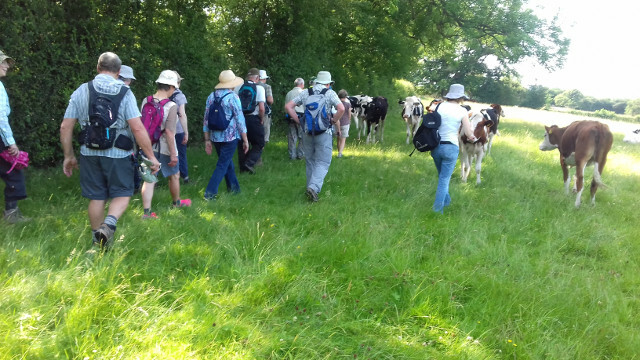 The walk started from the bus stop at the Poolend and took a six mile route cross-country back to Ledbury, passing through a number of different farms in the parishes of Pixley, Putley, Aylton and Little Marcle. No sooner had we left the bus, than we were greeted by Anna Bird of Pixley Berries, whose main pressing plant is right by the bus stop. Anna presented the group with bottles of Pixley Berries Blackcurrant Cordial to be tucked into rucksacks to take to Putley Village Hall. The first part of our walk took us past the blackcurrant fields, through orchards and across pasture grazed by Holstein Friesian heifers before arriving at Putley Village Hall. A welcome chance to try the blackcurrant cordial, stop a while in the shade and view the exhibition of LFG photographs. From Putley, the walk joined the Herefordshire Trail, which we followed for two miles in the full glare of the sun. A brief introduction to David Watkins herd of friendly Herefords took the group to our next stop on the Cider Mill Field at Woodside Lodges, Little Marcle, where we were made very welcome. The LFG team had been at work plating up our locally sourced ploughman’s lunches: a whole Double Gloucester cheese from Charles Martell, eggs from William May, Peter Cook’s Bread, Netherend Farm butter, tomatoes and cucumbers from Little Marcle Farm Shop, strawberries from Siddington Farm, apple juice from Jus and Tumpy Ground cider from Once upon a Tree. Everyone took full advantage of the chance to relax (collapse?) in the shade under the trees, out of the midday sun. We were greeted by Andrew Powers, one of the farmers from our photo exhibition and also son-in-law to Ken Davies, whose family own Woodside Lodges. Andrew shared insights into some of the methods that guide his sheep farming, including the New Zealand technology that he has introduced. In his neighbouring field, his sheepdog Lyn was able to give us a short demonstration (too hot for more!) of her sheep handling skills, with a support act from her young daughter. Taking our farewells of Andrew, we rejoined the Herefordshire Trail to find John Davenport, organic vegetable grower and our other photo project farmer. We were soon to discover that John’s fields contain not one square inch of shade! He led us to one end of his polytunnels to demonstrate why it was wasn’t possible to do any work inside them in the heat – the intense blast of hot air coming out of the opening took us all by surprise! In the short time that we were able to stand in the full sun without keeling over, John was able to tell us a bit about his crop rotations, his irrigation system (very necessary!) and show us some of his produce that was ready to harvest. We then crossed the road and gathered under a very welcome tree to recover! We were now entering Redbank Fruit Farm, home of Cilla Clive and known by many for its production of dessert apples. But as we continued along the Herefordshire Trail, we were intercepted by Sally Booth from Haygrove Evolution. Lured to a shady spot by the promise of iced water, we looked out over recently planted vineyards. 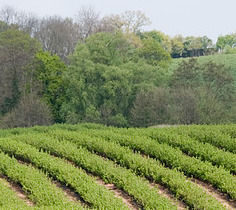 Having said that, Sally told us that historical records had been found which showed that the site had been planted as a vineyard by Thomas de Cantilupe, a thirteenth century Bishop of Hereford. What comes around goes around! We were treated to a tasting of wine from the Bacchus grapes before setting off on the last leg of our walk back into Ledbury. Not just a walk in the countryside but a fantastic slice through Ledbury’s farming landscape and the story that it tells. What a wonderful way to taste the great variety of local food and drink and to meet some of the people who work so hard to create such excellent produce for us to enjoy. Thanks to Herefordshire Walking Festival for giving us the chance to share it with others!